Background: Patients with end-stage liver disease are prone to hemodynamic disturbances which may be aggravated with liver transplantation. Blood pooling in splanchnic area and portal hypertension cause reduction in central blood volume. Terlipressin reduces mesenteric and hepatic blood flow, causing vasoconstriction in the smooth muscles of the arteries in the splanchnic region. Objective: We investigated the efficacy of perioperative terlipressin infusion in patients who received living donor liver transplantation (LDLT) on hepatic and renal functions. Design: Retrospective. Setting: University hospital. Method: The study included 86 adult patients who received LDLT, due to end-stage hepatic disease, between April 2014 and July 2016 in our institute. Data were collected by searching the medical archives of patients. A standard anesthesia protocol was administered to all patients. In a selected group of patients, terlipressin infusion was initiated at 3 μg/kg/h, immediately after anesthesia was induced. The dose was halved following arterial anastomosis and was continued at this dose for the subsequent 3 days. Patients who received terlipressin infusion were compared with patients who did not receive it. Main Outcome Measures: There is no evidence in this trial to show evidence of effectiveness as a result of terlipressin infusion. Results: Patients in the terlipressin group were statistically significantly older. Central venous pressure, cardiac index, global end diastolic volume, and extravascular lung volume did not show significant differences between the groups. Urine output was similar in both groups; however, regarding the use of packed red blood cells and fresh frozen plasma, terlipressin group patients needed more packs. Perioperative liver function tests were similar between the groups except for aspartate aminotransferase and alanine aminotransferase values on the first and third postoperative days. Conclusion: Terlipressin infusion was not found to be significantly effective among the liver and kidney function tests. Limitations: This may be a result of randomization defect of our retrospective study design. Many prospective randomized studies should be planned to reach more accurate results. Patients with end-stage liver disease are prone to hemodynamic disturbances which may be aggravated with liver transplantation. Clinical presentation is with hyperdynamic circulation with increased cardiac output, heart rate (HR), and plasma volume and decreased blood pressure and systemic vascular resistance (SVR). Blood pooling in splanchnic area and portal hypertension cause reduction in central blood volume. These changes lead to high risk of renal dysfunction in cirrhotic liver failure patients. To reduce portal blood flow, surgical techniques, such as splanchnic artery ligation, splenectomy, portocaval shunt, or splanchnic vasoconstrictor drugs such as vasopressin and terlipressin, can be used. Terlipressin (tricyl-lysine-vasopressin) is a vasopressin analog used to correct renal functions in hepatorenal syndrome in patients with cirrhosis. It reduces mesenteric and hepatic blood flow, causing vasoconstriction in the smooth muscles of the arteries in the splanchnic region through activation of vasopressin-1 receptors. Also, the blood flow is shifted from the splanchnic area to the systemic circulation. Studies have shown preserved renal functions with perioperative terlipressin infusion in living donor liver transplantations (LDLTs). Furthermore, modulation of splanchnic circulation helps preserve perioperative renal functions. This is due to the increase in effective blood flow, as well as the increase in the mean arterial pressure (MAP). Although studies have examined the systemic, portal, renal, and hemodynamic effects of terlipressin in patients with cirrhosis, its accurate and effective means of administration and its safety profile have not yet been established.,, In this study, we aimed to examine the effect of perioperative terlipressin infusion in patients who received LDLT on hepatic and renal functions. Since April 2013, 170 liver transplantations were performed in Medipol University Faculty of Medicine Department of Organ Transplantation. Pediatric (n = 28) and cadaveric patients (n = 31) were not included in our study. The study included 86 adult patients who received LDLT, due to end-stage hepatic disease, between April 2014 and July 2016. 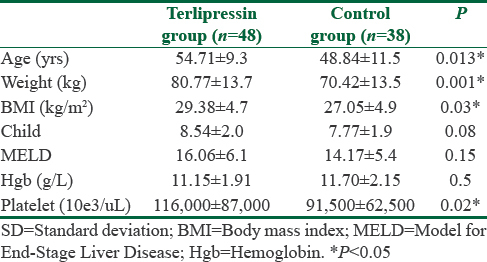 Terlipressin group (Group TR) included 48 patients, whereas control group (Group C) included 38 patients. This retrospective, observational, single-center study was approved by the ethics committee at our institution. Data were collected by searching the medical archives of patients. Patients younger than 18 years old, retransplantation patients, patients with hepatopulmonary syndrome, and patients who had creatinine levels above 1.2 mg/dL were excluded from the study. A standard anesthesia protocol was administered to all patients. For all patients, 2 mg/kg propofol, 2 μg/kg fentanyla, and 0.1 mg/kg vecuronium were used to induce anesthesia. For maintenance, all patients received 1 MAC sevoflurane in a mixture of O2 (50%) and air. In all patients, a 5F pulse contour cardiac output (PICCO) catheter was routinely inserted in the right femoral artery, as well as in the right internal jugular vein and right radial artery under ultrasonography guidance. In a selected group of patients, terlipressin infusion was initiated at 3 μg/kg/h, immediately after anesthesia was induced (Group TR). The dose was halved following arterial anastomosis and was continued at this dose for the subsequent 3 days in all Group TR patients. Patients who received terlipressin infusion were compared with patients who did not receive it. For all patients, a target central venous pressure (CVP) between 5 and 7 mmHg was aimed. Transfusions were performed to keep hemoglobin levels between 8 and 9 g/dL. Other blood products were administered under the guidance of rotational thromboelastometry. Norepinephrine infusion was initiated in all patients whose MAPs were <60 mmHg and systemic vascular resistance indices (SVRIs) were <600. The cardiac index (CI) target was 2.5-3.0 L/min/m 2. Patients' hemodynamic parameters during the operation [MAP, HR, CVP, CI, SVRI, and extravascular lung water index (ELWI)], anhepatic and neohepatic phase laboratory values, and the amount of the colloid, crystalloid, blood, and blood products used were recorded. Hourly blood gas monitoring was performed. Renal functions were monitored by urinary output, serum creatinine, and electrolyte levels. Liver functions were monitored using hepatic function tests [aspartate aminotransferase (AST), alanine aminotransferase (ALT), albumin, bilirubin, cholesterol, lactate, and international normalized ratio (INR)]. All laboratory results and the amounts of fluids, blood, and blood products infused until postoperative seventh day were recorded. Complications that occurred during 7 postoperative days, duration of intubation, and duration in the intensive care unit (ICU) were compared between the groups. The sample size was calculated as 30 per group based on the anticipated 25% change in the SVRI (α at 0.05, maximum β = 20% with a power of 85%). Data were statistically analyzed using SPSS 16.0 (Chicago, IL, USA) software. Data were expressed as mean and standard deviation. Comparisons were performed using an independent t-test. Within-group comparisons were achieved using repeated measures analysis of variance. Chi-square test and Fisher's exact test were used to determine associations between qualitative variables. There are statistical differences between groups considering demographical properties [Table 1]. CVP, SVRI, HR, CI, global end diastolic volume (GEDI), and ELWI did not show significant differences between the groups. The mean volume of colloids administered intraoperatively in Group C was 4765 ± 110 mL, which was significantly lower than Group TR (6340 ± 299 mL, P = 0.002). The amount of estimated intraoperative blood loss was significantly different between groups (P = 0.03). Urine output and creatinine levels were similar in both the groups. Regarding the use of packed red blood cells and fresh frozen plasma, Group TR patients needed more packs (P = 0.02). Pre- and intraoperative laboratory results are shown in [Table 2]. Postoperative liver function tests were similar between the groups except for AST levels on the third postoperative day and ALT levels on the first and third postoperative days [Table 3]. On the postoperative seventh day, the significant differences disappear and AST and ALT values became similar among groups. The incidence of postoperative vascular and biliary complications was similar in both the groups [Table 4]. However, mean operation times (Group TR: 7.76 h; Group C: 6.91 h), ICU duration (Group TR: 2.74 days; Group C: 1.65 days), and hospital stay (Group TR: 12.86 days; Group C: 10.70 days) were significantly longer in Group TR (P = 0.02). The results of this study indicated that terlipressin infusion in patients who underwent LDLT resulted in similar changes among the patients in control group. It could not be possible to talk about the superiority of terlipressin on hepatic function tests. However, in this retrospective study design, the patients in the terlipressin group were significantly older and tended to have more severe medical conditions preoperatively than the ones in the control group, resulting in slightly higher Model for End-Stage Liver Disease (MELD) scores. Some results, especially the ones related to ICU stay and complication rates, might be affected by the preoperative worse conditions of the patients. Normally, the blood volume in the abdominal organs should constitute less than 30% of the total blood volume. However, it was more than or equal to 30% in cirrhotic patients., Splanchnic circulation is the primary mechanism regulating the circulating blood volume and systemic blood pressure in cirrhotic patients with accompanying portal hypertension. Increased portal blood flow causes impaired liver regeneration, which disturbs the postoperative healing process. Kiszka-Kanowitz et al. have shown that there is an abnormally increased blood volume in patients with end-stage liver disease and that this excess blood volume is also abnormally distributed., Terlipressin selectively stimulates V1 receptors, which causes arteriolar vasoconstriction in the splanchnic area, with a shift of blood from the splanchnic to the systemic circulation. It is supposed to reduce this venous congestion, renew central blood flow, and optimize blood volume after liver transplantation surgery. It serves to improve effective blood volume and MAP. Conventionally, terlipressin is administered through intermittent IV bolus injections, whereas in this study, it was preferred to administer through infusion. Thereby, we were able to increase systemic blood pressure without causing any adverse effects such as an increase in peripheral resistance. We used a slightly higher dose compared to the recent studies using low-dose infusion.,, We preferred the same infusion dosage as Fayed et al. applied to their patients. In contrast to their results, unfortunately, we could not demonstrate any significant superiority over Group C, regarding its effects on renal functions. However, when compared with the preoperative values, hepatic function tests healed faster than expected in Group TR, and on the postoperative seventh day, significant differences disappear. Hepatic function tests were similar between the two groups after postoperative seventh day. Terlipressin was previously shown to have a beneficial effect on hemodynamics and related perioperative outcomes in LDLT. In this study, CVP, SVRI, HR, CI, GEDI, and ELWI were not significantly different between Group TR and Group C. However, as the terlipressin infusion continued, better results were obtained on repeated SVRI and CI measurements compared with the initial results. Terlipressin infusion was found to be beneficial among repeated measures in terlipressin-receiving patients. Increased SVR, which is induced by terlipressin, causes a shift of blood volume from the hepatosplanchnic area to the central compartment, which results in improved major organ perfusion and systemic blood pressure. Several studies have shown that terlipressin infusion has beneficial effects on renal functions., However, this study followed a different approach regarding dosage and administration of terlipressin. Only those patients with creatinine levels below 1.2 mg/dL were included in the study. Hence, neither renal function tests nor urinary output showed significant differences between the groups. Yagi et al. have shown that increased portal venous pressure after LDLT had adverse effects on graft functions and serum AST, bilirubin, and INR levels. Reduced splanchnic flow via administration of terlipressin has been associated with splanchnic hypoperfusion, and no difference has been observed in lactate levels between the groups that did or did not receive terlipressin. We also found similar lactate levels in both the groups. When we examined the transfusion rates, terlipressin infusion was not sufficiently effective to decrease neither transfusion requirements nor the volume of fluids. In contrast to many previous studies, no difference was observed between groups regarding MAP and SVR. Also, the need of norepinephrine and dopamine was comparable between the groups. The main effect of terlipressin was that repeated measures of SVRI were better when compared with the first measurements. The limitations of this study include the lack of a double-blindness and randomization due to the retrospective study design. Hence, mostly patients with worse clinical conditions received terlipressin. Another important limitation is that portal vein pressure measurements were not measured and recorded. In conclusion, in patients undergoing LDLT operation, perioperative terlipressin infusion was not effective by means of hepatic functions. To indicate its importance in patients who received LDLT, prospective, randomized, double-blinded studies in large patient groups should be designed. Fayed N, Refaat EK, Yassein TE, Alwaraqy M. Effect of terlipressin infusion on systemic, hepatic and renal hemodynamics during liver donor liver transplantation. J Crit Care 2013;28:775-82. Mukhtar A, Mahmoud I, Obayah G, Hasanin A, Aboul-Fetouh F, Dabous H, et al. Intraoperative terlipressin therapy reduces the incidence of postoperative acute kidney injury after living donor liver transplantation. J Cardiothorac Vasc Anesth 2015;29:678-83. Fahrner R, Patsenker E, Gottardi A, Stickel F, Montani M, Stroka D, et al. Elevated liver regeneration in response to pharmacological reduction of elevated portal venous pressure by terlipressin after partial hepatectomy. Transplantation 2014;97:892-900. Baik SK, Jeong PH, Ji SW, Yoo BS, Kim HS, Lee DK, et al. Acute hemodynamic effects of octreotide and terlipressin in patients with cirrhosis: A randomized comparison. Am J Gastroenterol 2005;100:631-5. Narahara Y, Kanazawa H, Taki Y, Kimura Y, Atsukawa M, Katakura T, et al. Effects of terlipressin on systemic, hepatic and renal hemodynamics in patients with cirrhosis. J Gastroenterol Hepatol 2009;24:1791-7. Mukhtar A, Dabbous H. Modulation of splanchnic circulation: Role in perioperative management of liver transplant patients. World J Gastroenterol 2016;22:1582-92. Kiszka-Kanowitz M, Henriksen JH, Moller S, Bendtsen F. Blood volume distribution in patients with cirrhosis: Aspects of the dual-head gamma-camera technique. J Hepatol 2001;35:605-12. Hong SH, Lee JM, Choi JH, Chung HS, Patk JH, Park CS. Perioperative assessment of terlipressin infusion during living donor liver transplantation. J Int Med Res 2012;40:225-36. Morelli A, Ertmer C, Lange M, Westphal M. Continuous terlipressin infusion in patients with septic shock: Less may be best, and the earlier better? Intensive Care Med 2007;33:1669-70. Umgelter A, Reindl W, Schmid RM, Huber W. Continuous terlipressin infusion in patients with persistent septic shock and cirrhosis of the liver. Intensive Care Med 2008;34:390-1. Krag A, Moller S, Henriksen JH, Holstein-Rathlou NH, Larsen FS, Bendtsen F. Terlipressin improves renal function in patients with cirrhosis and ascites without hepatorenal syndrome. Hepatology 2007;46:1863-71. Yagi S, Iida T, Taniguchi K, Hori T, Hamada T, Fujii K, et al. Impact of portal venous pressure on regeneration and graft damage after living-donor liver transplantation. Liver Transpl 2005;11:68-75. Wagener G, Gubitosa G, Renz J, Kinkhabwala M, Brentjens T, Guarrera JV, et al. Vasopressin decreases portal vein pressure and flow in the native liver during liver transplantation. Liver Transpl 2008;14:1664-70.